In case you haven't noticed, I love Christmas. But I'm not gonna lie, this year... it's been a little tough getting into the spirit. It's not just the insane and terrifying warm weather (anyone who cracks wise about how much they love global warming gets a smack). There've been some personal dramas, way too many of my former Christmas cohorts have declared they no longer give a crap about the holiday, and some of my decades-running family traditions are apparently—suddenly—a thing of the past. But I'm trying, Rudolph... I'm trying real hard to be the Grinch / Scrooge at the end of their respective stories, not the beginning. 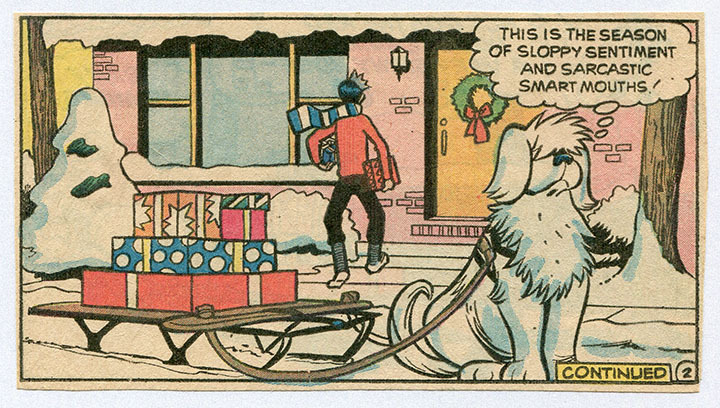 In that spirit, I'm presenting links to almost every Christmas-themed thing I've posted on the Pops blogs since I started them a decade ago. Anyone looking for a dose of virtual spiked egg-nog, look no further. And please feel free to propagate. I feel like we need some holly jolly more than ever right now. • 2015: Four Color Traditions installment of PRINCE STREET NEWS from Back Issue! #85. • 12/21/2015: The second Pops Gallery of 101 Christmas Comic Book covers. • 12/17/2015: The Pink First Noel: A sappy true story involving a homeless woman, a pink violin, and leftover sandwiches. • 12/18/2013: An excerpt from the chapter on Christmas in COLLECTOR'S EDITION. • 12/10/2013: The first Pops Gallery of 101 Christmas Comic Book covers. • 2012: My comic strip for Saveur.com's "Recipe Comix" series about my holiday cookies. • 2010: The cover to my holiday CD compilation, GRUSS VOM KRAMPUS. • 2010: The cover to the Secret Country holiday single, "Hard White Snow." • 12/22/2007: Random Holiday Thoughts. Most of which still stand. • 2007: the mystery of the spiky haired kid and the twins from A Charlie Brown Christmas is revealed! • 2004: Super Santa Christmas card (I was going to redraw this for this year's Jingleberries tune, but, as with so many other things this year, simply didn't have the time). • 2004: From mtv.com's MUSIC GEEK: Ho-Ho-Hurl: The Most Hideous, Horrible Holiday CDs. • 2004: A plea for a special edition DVD for A Charlie Brown Christmas (something that STILL doesn't exist, even on the damn thing's 50th anniversary). • 2000: the cover to my first Christmas compilation CD, A GINGER PEACHY CHRISTMAS. • 1999: "It's a Wonderful Life" episode of S'TAN & SOCIAL GRACE as appeared in the New York Hangover (and here's my S&SG Xmas card from that same year). ALSO, here's a link to the Soundcloud page for the Jingleberries, the indie Xmas band formed by my girlfriend, my friend Jeff, and myself back in 2009 (not to be confused with the other Jingleberries Christmas band... one day we'll have to figure this out, too). Anyway. Have a Merry Christmas (or whatever phrase you prefer) and a Happy New Year. See you next year.